High-level representatives from businesses and the education sector gathered in Brussels, Belgium, on 7 December 2017 to discuss how to advance and scale up business-education cooperation to improve Science, Technology, Engineering and Mathematics (STEM) studies and careers in Europe. 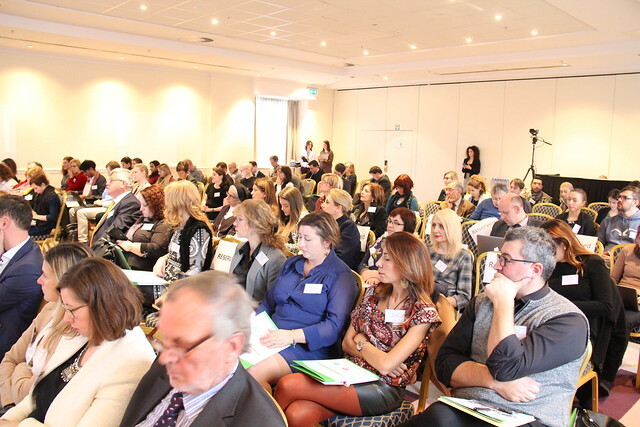 The conference, jointly organised by the STEM Alliance and the SYSTEMIC project, funded by the European Union's Erasmus+ programme, demonstrated the business case for companies to invest in STEM Education and enhance the attractiveness of STEM jobs in Europe. The event was opened by Michael Teutsch from the European Commission's Directorate General for Education and Culture, and Sarah Atkinson, Vice-President of CA Technologies, a STEM Alliance partner. Co-chaired by Marc Durando, Executive Director of European Schoolnet, and Celia Moore, Member of the Board of Directors of CSR Europe, the event hosted a wide mix of companies, Ministries of Education and educational organisations that are strongly engaged in promoting STEM education and careers to young Europeans. The award was given to teachers by Annelie Kohl, representative of Shell, and Luisa Barba, representative of Microsoft. The award was given by Stephan Griebel, representative of Texas Instruments, and Nathalie Debuyst, representative of the European Petrochemical Association. The award was given by Julie McCallum, representative of CA Technologies, and Jeannette Axisa, representative of Transport Malta. Results of the STEM Discovery Week in 2017. One year progress of the STEM Alliance. Results of the first two Massive Open Online Courses (MOOCs) on STEM careers. The Professionals Go Back to School Scheme.